Chris Turner will be honoured at the ABAX Stadium. The public of Peterborough have been urged to come out in force to honour one of the city’s greatest characters. Peterborough United stage the Chris Turner Memorial match on Saturday (August 1, 3pm) when local rivals Cambridge United are the visitors the ABAX Stadium. And one of his former team-mates from the 1970s, Tommy Robson, insists ‘a giant of a man’ deserves a huge attendance. “Chris is the greatest character in Posh history,” Robson said. “He had success as a player and a manager and just as importantly he had everyone’s respect as a person. “He is a club giant. In fact he is a city great. The whole city loved him which was proven by the numbers who attended his funeral at the cathedral. “It was packed out because everyone wanted to pay their respects to an outstanding person. 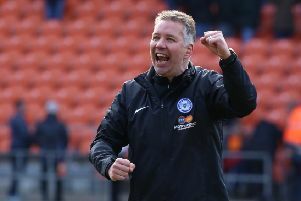 “I hope that is the case on Saturday because he deserved another great send-off from the players and supporters of both Posh and Cambridge United. I wouldn’t miss it for the world and I hope thousands of other people think the same as me.” Robson will be joined at the game by other team-mates from Turner’s Posh playing days. All-time Posh leading goalscorer Jim Hall and John Cozens. Turner’s captain in the 1973-74 Fourth Division title-winning side, are expected to attend. Current Posh boss Dave Robertson is a massive Turner fan and he will ask his players to put on a show worthy of the club’s greatest-ever manager. “It’s a big day for Peterborough United and Cambridge United,” Robertson said. “Both clubs are keen to put on a fitting spectacle. Fans are reminded that this match is all-ticket and none will be sold on the day of the game. All proceeds from the game will go to the Glenfield Care Home, Wisbech where Turner spent the last few years of his life.